Five Days of Fun came to a close Saturday, but there was still plenty of activity on the last day of the Clackamas County Fair. Young people showed their livestock in the barns, and the Kitchen Cupboard was a-buzz with a cooking competition and chocolate cake tasting. Four North Clackamas Future Farmers of America members were on hand to talk about showing their various animals during the week of the county fair. 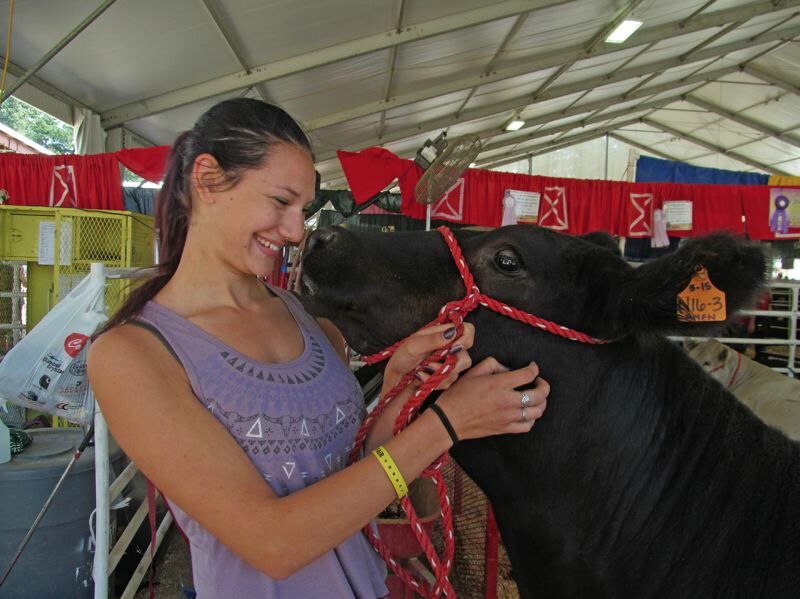 Vanessa Youngsma, 18, a recent graduate of Clackamas High School, said that Hallelujah, a 1-and-a-half-year-old breeding heifer, was reserve grand champion for breeding heifers. She said she likes breeding cattle because she loves their personalities and described Hallelujah as "a super sweet animal." 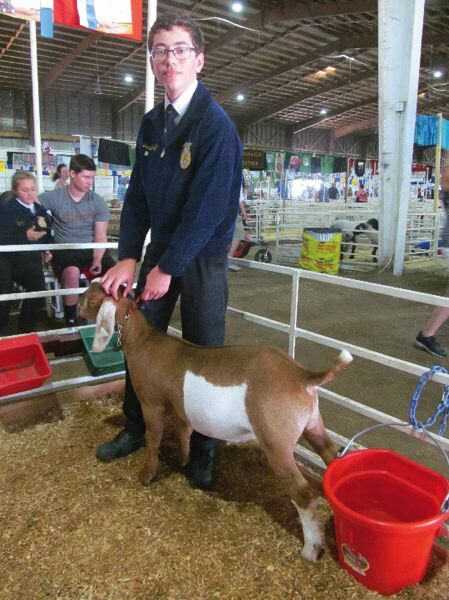 Another CHS student, Joshua Huff, 16, showed Bruce, a Boer goat, at the fair this year. "With goats, you never know what to expect, but they are always fun," he said. 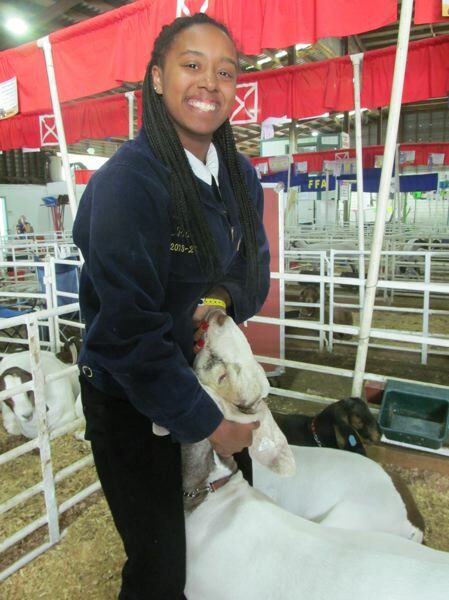 MaKenzie Pool, 17, a Rex Putnam High School student, also showed a goat at the fair. She won third in showmanship with Tucker, a crossbred Boer. Goats "have a fun personality," she said, adding that Tucker "likes to nibble," and he once chewed a hole all the way through her pants. 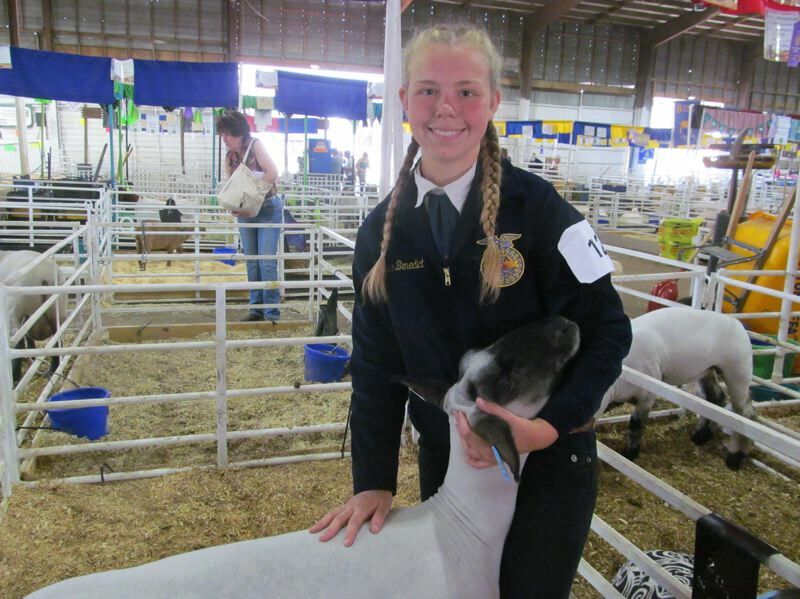 Kailee Benedict, 17, another RPHS student, showed a crossbred lamb at the county fair. "He's very friendly and fell asleep in my arms while I was showing him," she said. The 138-pound lamb won reserve champion for market lambs and was auctioned off. 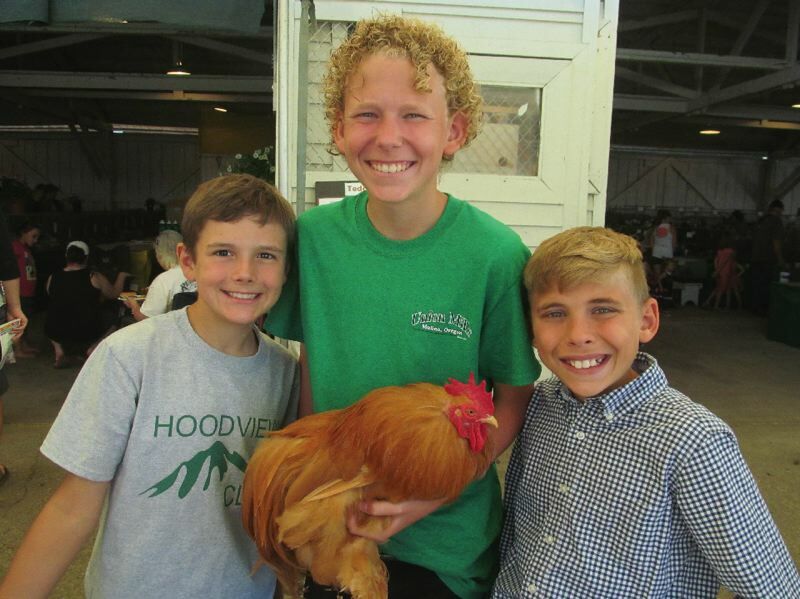 Three younger students from around the Clackamas County area also showed livestock at the fair. 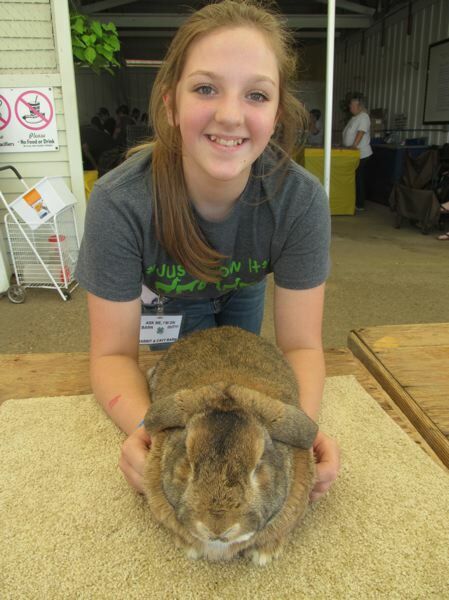 Colton resident Hailey Davis, 13, won first in showmanship and second in another category with Clover, her mini-lop Rex rabbit. She raises all kinds of animals at home, but likes rabbits because they're nice and you can snuggle with them. Ian Cernitz, 14, will attend Canby High School in the fall. His buff cochin chicken won best bantam, and Cernitz was chosen a champion in showmanship. "I enjoy coming to the fair to share the experience of [raising chickens]," he said. "Guinea pigs don't smell as bad as rabbits and are entertaining to watch," said Carly Shanklin, 14. 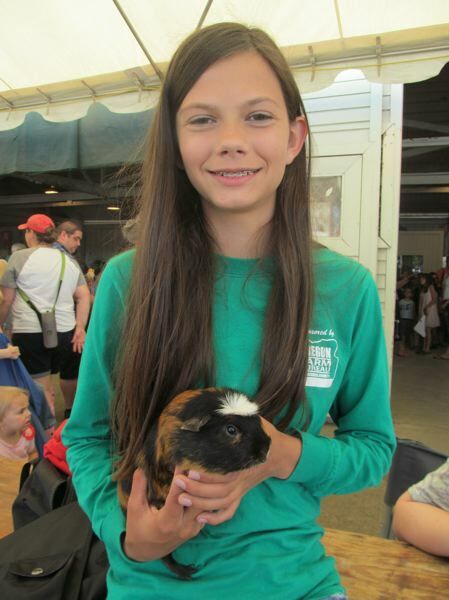 She will attend Wilsonville High School in the fall and noted that Jerry, her brindle, white-crested guinea pig, won champion in his breed class. The males-only chocolate cake competition was popular this year, with a record-breaking 14 entries, said Naomi Sommers, assistant superintendent in the Kitchen Cupboard. 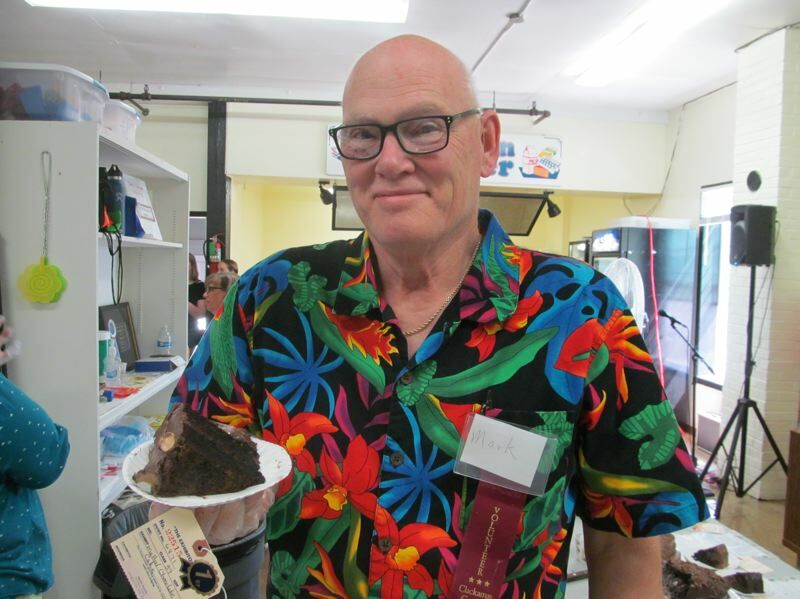 The first-place winner was Mark Smith, with his malted chocolate cake trimmed with malted-milk balls. He found the recipe on the website addapinch.com and said he chose to make this cake because he had never seen one like it at the fair before. Smith also won first place in the same competition in 2012 and 2014. Two young brothers from Oregon City won second and third places in the chocolate cake competition. Mason Flack, 5, won second place with his gooey peanut butter cake. He entered in the baking-buddy category, which means he worked with an adult on the cake. His brother, James, 9, took third place with his chocolate orange dream cake. After the winners were announced, visitors to the Kitchen Cupboard lined up and sampled all the chocolate cakes.